How many of you realized that I put up The Soda Can Stove website? 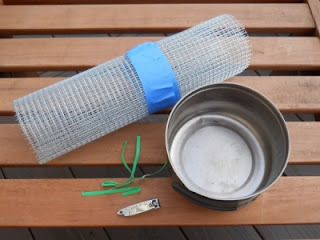 I did that a couple of years ago and haven't really done much with it except directions for building a soda can stove, but I occasionally get e-mails from people with questions about their stove, fuel, or to tell me about things they do differently. I'm almost always a little surprised when I get such messages because it's not a website I think about very often and update even less. So I've started working on it again. 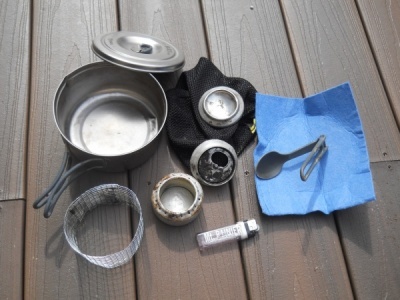 And first up, is a new page: A Backpacker's Cookset, Exploded. It has my cookset deconstructed, as it were. I get a lot of questions about exactly what I carry and how much individual items in my pack weigh. Obviously, that covers a lot of areas--packs, sleeping bags, shelters, etc. But since this is a soda can stove website, I'm starting with my cookset. I even went so far as to weigh every single item in it for those of you wondering what kind of weight it has. Some of you might be surprised to learn that I've never done this before. While weight is always an all-encompassing issue to a backpacker, the absolute weight of an item isn't so much a concern for me as the relative weight of an item. I don't really need to know that my stove weighs 0.5 ounces or that my pot weighs 3.0 ounces--I just need to know that it weighs less than the alternatives out there. So it's very uncommon for me to weigh any of my gear. Except my pack, which I'll sometimes weigh just to get a sense of what I'm dealing with overall. The individual items in my pack, though? Never! In more completely unrelated news.... For those of you wondering when I'll be having another Great Adventure and using this stuff--I plan to hit the Camino de Santiago this August.